Sometimes getting dinner on the table can be difficult even on the best of days. During the hectic holiday season it may seem down right impossible. So how do you keep your kids eating healthy? What about when your dinner count doubles due to unexpected guests that you must feed on a moments notice? I found the answers to these questions and more while wandering around the web this week. To find out what each of those mean, check out her post Five simple ways to get your kids to eat well. 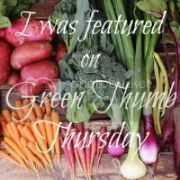 Then over at Like Mother, Like Daughter, Leila answers how to be prepared for hungry unexpected guests while making something out of nothing, when a reader asks, How can I be hospitable to my kids' friends, foodwise? 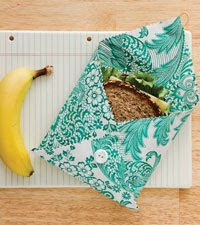 While searching Flickr for Meatless Monday inspiration, I found instead a tutorial for a sandwich sack to store your food in. This led me to another tutorial on Kiwi Magazine's site for a holiday wreath made from plastic shopping bags. 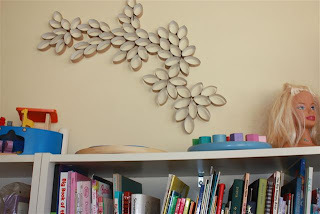 This one is a great piece of wall art made from toilet paper rolls. No kidding! (No, that is not why I requested 145 wrapping paper/paper towel tubes on Facebook.) That Flickr photo linked me to the tutorial of how to make it and a great blog - Growing up Creative - full of creative recycled crafts. I could go on all day, jumping from one Flickr photo to the next finding great inspiration and new favorite blogs along the way. Rather than give away all my Superhero Secrets in one shot, I will use restraint and leave you with one final fantastic tutorial. How clever is that? I have one of these dusters sitting under the sink, collecting dust no less. Foregoing disposables, left me with a handle with no purpose. 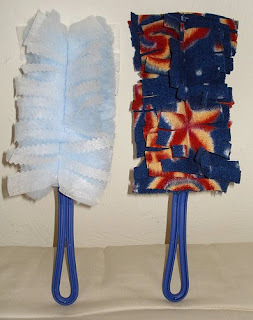 Thanks to this tutorial I can make my own reusable duster refill and save two items from the landfill. Why didn't I think of that? 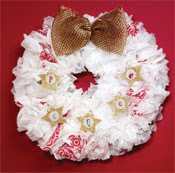 I just saw plastic bag wreath over at Design Sponge too. A little different, frothy-ier. Is that even a word? Anywho, love the reuse idea for holiday decor. I love design sponge. Yeah, that one is definitely frothy-ier. I'm starting to see them all over now. Everyone needs a little inspiration now and again, right?